President of the Republic felt what thousands of commuters feel every day when going to work after he was stuck on a train from Mabopane to Bosman for several hours. 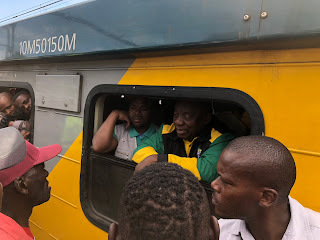 As part of the 2019 general election campaign, President Cyril Ramaphosa was on Monday boarded on a train from Mabone to Bosman; unfortunately, it was just another day in Prasa trains that always delay. The president was stuck for over 2 hours inside a full train with commuters heading to work and school. The train which was reported 2 hours late on departure had to delay more hours before arriving at the Pretoria Station. Most commuters resorted to boarding off the train and walk meanwhile others had to catch taxis at the nearby highway. This trauma is experienced on a daily basis throughout South Africa and this was a great experience to the highest authority. The president was also reported to be late for the ANC Top Six meeting scheduled for today. Watch some of the moments captured by eNCA's Aldrin Sampear throughout the journey. The Pres along thousands others on the train are LATE.